"The greatest American Heroes are back" and they've been set up to take the fall for a terrible crime they didn't commit. Roadblock (Dwayne Johnson) leads a new team (including Channing Tatum and Bruce Willis) on this explosive adventure. Action sequels don't tend to live up to the originals - especially when none of the actors from the first film make an appearance but Retaliation breaks that mould. Dwayne Johnson ('Fast 6') plays Roadblock, a sergeant in charge of a G.I Joe squad who are all but wiped out when a mission goes badly wrong. Revenge is the order of the day as Roadblock and the two surviving Joes go on the run and try to prove that the President of the United States (Jonathan Pryce) is an imposter. 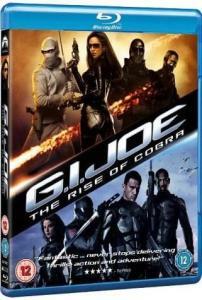 Cue lots of gun play and some fast martial arts as the Joes 'cut' their way through their mortal enemy, Cobra. Add in a cameo from Bruce Willis (what film isn't he in at the moment) and you get a slick action movie that surpasses the original.